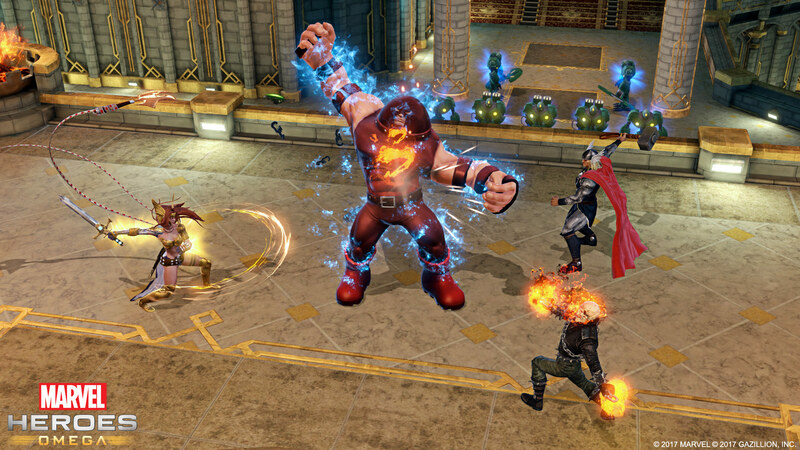 Marvel’s free-to-play MMO is the perfect casual time-killer. I’ve been playing Marvel Heroes for a while now. Quite a long time ago, gripped by the cinema-driven Marvel mania that’s been going on over the last few years, I downloaded whatever version of the game was current at the time and tooled around leveling up Iron Man, Squirrel Girl and a few others. For a while, Marvel Heroes was a staple of my gaming time, a game I’d casually sink an hour or so into weekly but not play religiously. I gradually fell off the Marvel Heroes train, but now I’m back. The catalyst for my return was the release of Marvel Heroes Omega – the first time the series has landed on console for PS4 and Xbox One and also an update for the long-standing PC version of the game. Omega repackages a lot of the same content from the previous versions of Marvel Heroes into a new, sleek and console-friendly package. Thanks to the fact that this is a constantly-evolving game that’s always receiving new updates in line with new Marvel Comics and Film releases, it’s quite different to what went before despite having the same base stuff in it. 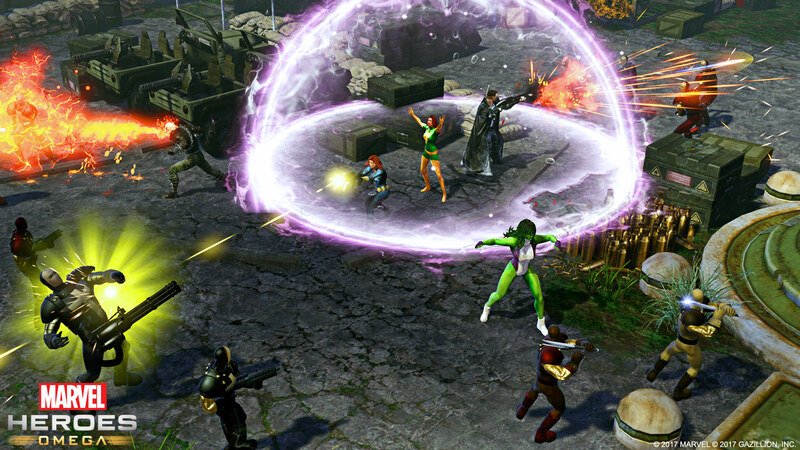 For the uninitiated, Marvel Heroes is a Diablo-like isometric perspective game with strong MMO elements. It features a lot of what you’d expect from that sort of game: colour-coded, loot, managing large groups of enemies with both up-close DPS attacks and ranged group attacks, a story mode you tackle alone and various challenge areas and raid-style bosses at the high end that must be attempted by multiple players banding together. From a visual perspective Marvel Heroes looks a little like the Marvel Ultimate Alliance games, though there’s a deliberate, Diablo-like stiffness to the movement too. On console you have access to eight skills – one for each face button, with the contents of each button flipping over to a different set when you hold down the left trigger. This ultimately makes it the same as the PC version, which instead features a more traditional skill hotbar. The combat feels pretty much as you’d expect from this genre, though the wide range of abilities available to the cast of playable Marvel superheroes means that there’s quite a good breadth of abilities and character types, though the game does have the usual issues with some characters being defined as absolutely being the ‘best’ for the end-game content. I’m not bothered about that as a casual player, however – I just play who I want. I’ve been tackling things as Luke Cage lately, and I’ve been enjoying his brawler style with the added ability to summon the likes of Jessica Jones and Misty Knight to fight alongside him. It’s cool stuff, and crucially it all feels like a legitimately strong entry in this genre. Part of why Marvel Heroes Omega isn’t just some simple licensed affair is the talent involved: while he’s no longer there, Diablo designer David Brevik was in charge of developer Gazillion Entertainment while Marvel Heroes was in its earliest stages. The game that’s out now surely bears the signs of that pedigree, and that’s why the PC version has slowly clawed its way from a Metacritic in the fifties to the eighties since 2013. The console version that’s now out feels like the culmination of that: a tight package with a great cast of characters – and, of course, it’s free. Marvel Heroes handles its free-to-play business pretty well, offering easy ways for you to earn more characters beyond those you choose to start with in-game. Characters can be raised to level 60 and the entire slate of actual content is free – it’s just all about characters, costumes and other optional upgrades such as boosts that’ll make you level up more quickly. 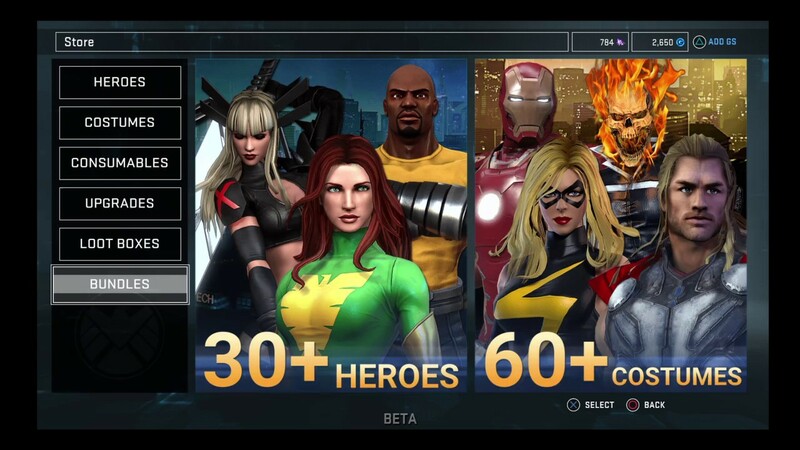 The selection of potential free characters includes some favourites like Captain America, while the rest of the roster can be played for free too – but only up to level ten. Once you reach level ten you’ll need to splash out to keep playing them either with Eternity Splinters, an in-game currency, or real cash. Eternity Splinters drop regularly but new characters are expensive, so expect to grind a little to remain entirely free. Characters work out at $5 and up each with prices varying depending on the character, and there’s often money-saving bundles available, too. The ability to play every one of the game’s cast free up to level 10 is a smart one, giving you time to get to know their play style, move set and voice work to see if you fancy using them more. The costumes are purely cosmetic and either drop or are purchased. They range from iconic comic looks through to ones based off their movie counterparts (if you specifically want the Age of Ultron Iron Man suit or the Civil War Iron Man suit, the game has you covered), and even ‘premium’ skins that give a character a full make-over. Fan favourite Spider-Gwen isn’t in the game as a character in her own right, but there’s a Spider-Man costume that changes Spidey’s look, voice and everything else to make Gwen playable. Currently the console version has way fewer heroes than the PC version, but it’ll slowly catch up over time. This feels like free-to-play done right, with important content available for free if with a little work and only optional, non-essential content locked behind a paywall. None of the actual game is locked behind a paywall: all of the story chapters and end-game content is available for free, single-player and multiplayer. Further, the EXP gain rate seems fair – meaning that you don’t feel pushed towards the boost items to speed up your progress. This is a difficult sort of system to balance, but Gazillion has nailed it here. After dabbling in dodgy stuff like three-figure cost DLC packs early on in its life, the game has found the correct approach in time for the new console release. It’s taken a while, but I’ve been slowly drawn into the other aspects of Marvel Heroes beyond logging in and playing a little bit more of the cheesy and simplistic story or killing time in a free-roam, open-world MMO space where supervillains randomly spawn. After getting Squirrel Girl to level 60 I finally began tackling end-game content and pairing up with other players for especially difficult fights. I’ve never felt the obsessive itch of having to worry about an optimum build or the best piece of epic gear with Marvel Heroes, however – and that’s ideal. I’ve got other games to play and loads to do, but when I’m paralysed by choice or just need to mindlessly de-stress without worrying about important story progress, dealing with the extreme stress of a close PlayerUnknown’s Battlegrounds game or losing my Street Fighter rank online, I go to Marvel Heroes Omega. Marvel Heroes is simply a great game to kill some time with – fight some battles, grab some loot, experiment with different characters and then hop back out. It’s ideal low-commitment online fun, and a perfect fit for free-to-play. If you’re yet to give it a try and like the Marvel stable of characters at all, it’s well worth a shot.